Amber fossils can be used to trace the history of disease-vector associations because microorganisms are preserved "in situ" inside the alimentary tract and body cavity of blood-sucking insects. Lutzomyia adiketis sp. n. (Phlebotomidae: Diptera) is described from Dominican amber as a vector of Paleoleishmania neotropicum sp. n. (Kinetoplastida: Trypanosomatidae). The fossil sand fly differs from all previously described extinct and extant members of the genus by the following combination of characters: Sc forked with the branches meeting the costa and radius veins; wing L/W value of 4.1; a δ value of 18; a ratio β/α value of 0.86, and the shape and size of the spatulate rods on the ninth sternite. The trypanosomatid is characterized by the structure of its promastigotes, amastigotes and paramastigotes and its transmission by an extinct species of sand fly. Morphological characters show that the fossil sand fly is a new extinct species and that it is host to a digenetic species of trypanosomatid. This study provides the first fossil evidence that Neotropical sand flies were vectors of trypanosomatids in the mid-Tertiary (20–30 mya). Moth flies (Psychodidae) and sand flies (Phlebotomidae) are primitive Diptera  often treated as subfamilies . The fossil record of sand flies dates back to Early Cretaceous Lebanese [3, 4] and Burmese amber . The Burmese amber sand fly, Palaeomyia burmitis Poinar  was transmitting Paleoleishmania protera Poinar & Poinar [6, 7], the first described fossil digenetic trypanosomatid parasite. The present study describes a second species of Paleoleishmania carried by an extinct species of Lutzomyia sand fly in Dominican amber. Drawing of Lutzomyia adiketis showing wing venation. Bar = 270 μm. Habitus of Lutzomyia adiketis . Bar = 240 μm. Terminalia of Lutzomyia adiketis . Arrow shows spatulate rods. Bar = 24 μm. Head of Lutzomyia adiketis . Small arrow shows Newstead's scales on base of third palpomere. Large arrow shows mandibles. Bar = 32 μm. Length = 1.3 mm; body, legs and antennae light brown. Head; Length, 315 μm; eye bridge absent; length of proboscis, 202 μm; maxillary palp extending well beyond tip of proboscis; length of maxillary palp, 544 μm; palpal formula 1-4-2-3-5; Newstead's scales in oval area on basal half of 3rd palpomere; lengths of palpomeres; 1, 44 μm; 2, 89 μm; 3, 120 μm; 4, 82 μm; 5, 209 μm; ratio of palp segments, 1/2 = 0.49; 2/5 = 0.43; 4/2 = 0.64; 1/5 = 0.21; 3/5 = 0.57; 4/5 = 0.39; 1/3 = 0.37; flagellomeres 14, fusiform; scape short, stout; pedicel globular, terminal 3 segments subequal, shorter and broader than remainder; lengths of antennomeres (in microns) 1, 38; 2, 63 (60); 3, 171 (171); 4, 92 (92); 5, 82 (89); 6, 86 (79); 7, 82 (82); 8, 79 (76); 9, 86 (82); 10, 82 (82); 11, 76 (79); 12, 75 (83); 13, 81 (68); 14, 51 (57); 15, 41 (48); 16, 41 (41) (terminal spine on segment 16, 10 (10); ascoids absent on flagellomeres; cibarium not visible. Length = 441 μm ; wing with Sc forked, one branch reaching costa, other branch reaching R1; Rs four-branched with all branches extending to wing margin; Rs shorter than R 2-4; R1 as long as R 2+3 ; R 2-4 longer than R 2+3; vein R2 longer than R2+3 ; veins Sc, R1, R2 and R3 noticeably curved anteriorly at costa (R1 perpendicular to costa), R5 straight, veins M1 and M2 curved posteriorly at costa, vein CuA2 meets wing margin distal to R 2+3 fork; termination of R1 distal to fork of R 2+3; wing long and narrow, length 1.23 mm, width 0.30 mm, L/W = 4.1; wing values, α = 246, β = 211, δ = 18, γ = 243; wing ratio values, β/α, 0.86; γ/α, 0.98; δ/β, 0.09; β/γ, 0.87; membrane hyaline, main veins and wing surface bearing microtrichia; hind femora lacking teeth, length metafemur = 662, forefemur = 580; metatibia = 857, protibia = 580; length metatarsomeres, 1 = 454, 2 = 233, 3 = 158, 4 = 126, 5 = 76; length protarsomeres, 1 = 315 (328), 2 = 189 (183), 3 = 126 (126), 4 = 113 (107), 5 = 50 (50); tarsal claws paired, simple, thin, small, curved sharply at base, length 18–23 μm; spermatheca and associated reproductive structures not visible. 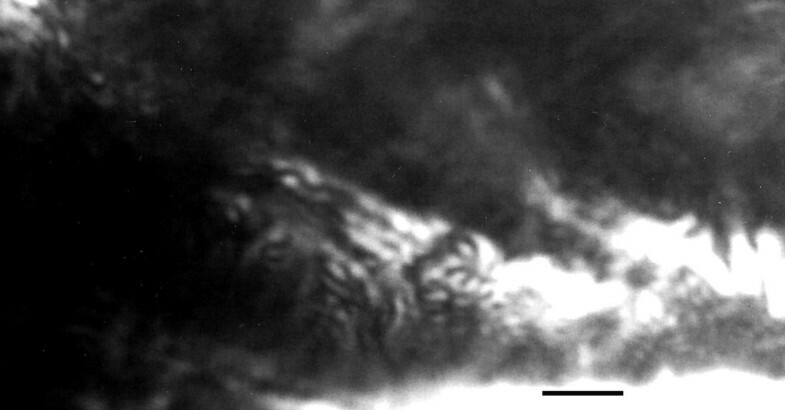 Abdomen extended, ten segments clearly visible; length, 800 μm; cerci 116 μm long and 54 μm wide; lobes on eight sternite 48 μm in length; spatulate rods 41 μm in length. Type specimen. – Holotype female in Dominican amber deposited in the Poinar amber collection (accession # P-3–5) maintained at Oregon State University. Etymology. – adiketis is from the Greek "adikos, which means injurious. 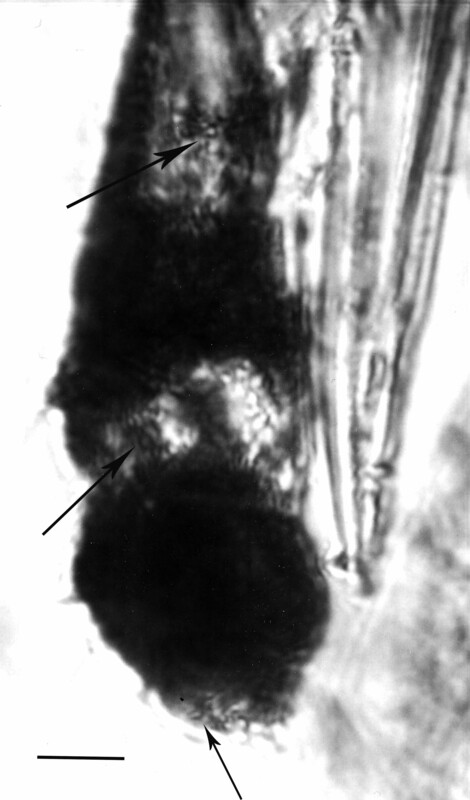 Inside the alimentary tract of L. adiketis were hundreds of promastigotes of a trypanosomatid parasite, some of which had entered the hemocoel of the fly. Amastigotes, promastigotes and paramastigotes occurred in the proboscis of the sand fly. This trypanosomatid is provisionally described below as a new species in the genus Paleoleishmania Poinar & Poinar , a collective genus established for fossil digenetic trypanosomatids associated with sand flies. Promastigotes of Paleoleishmania neotropicum in the foregut of Lutzomyia adiketis . Bar = 7 μm. 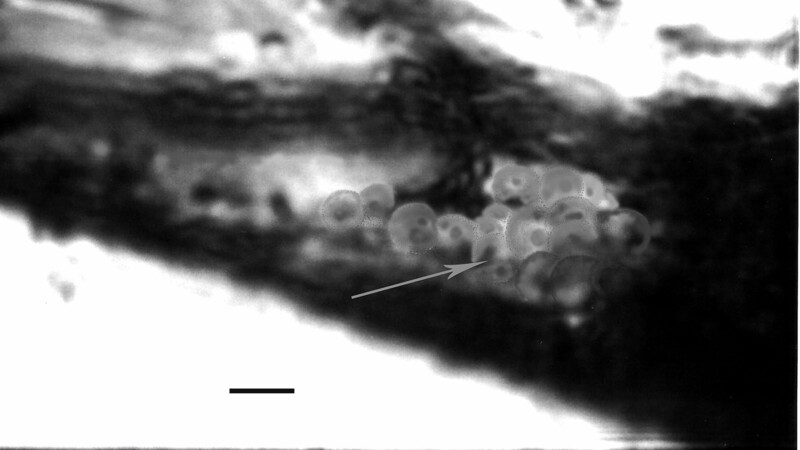 Promastigotes of Paleoleishmania neotropicum in the midgut of Lutzomyia adiketis . Bar = 7 μm. 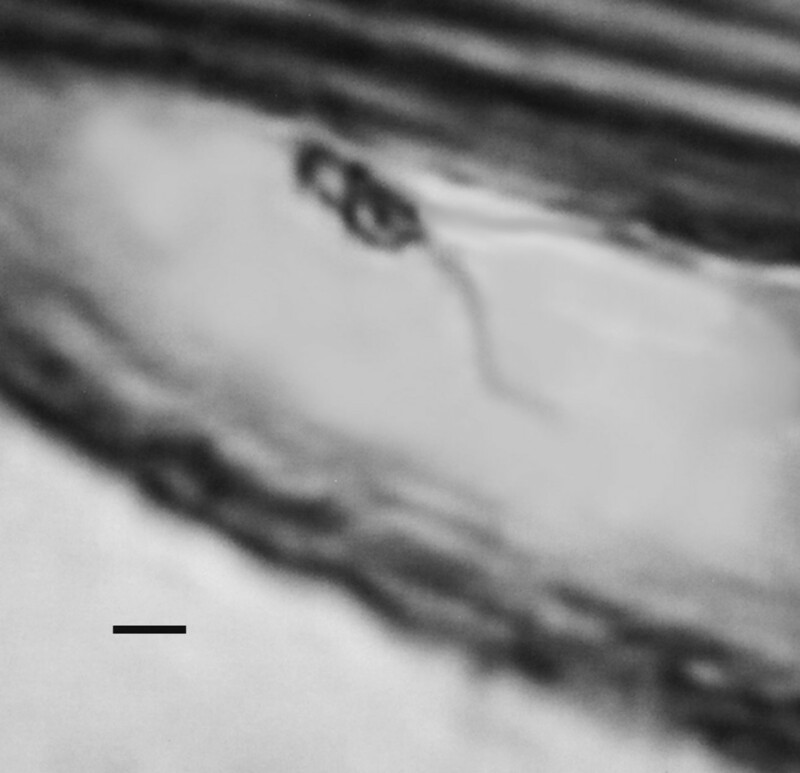 Promastigotes of Paleoleishmania neotropicum in the proboscis (arrows) of Lutzomyia adiketis . Bar = 20 μm. Four promastigotes of Paleoleishmania neotropicum in the proboscis of Lutzomyia adiketis . Bar = 4 μm. Cluster of amastigotes (arrow) of Paleoleishmania neotropicum in the proboscis of Lutzomyia adiketis . The large dark areas correspond to nuclei, while the smaller ones to kinetoplasts. Bar = 7 μm. Amastigotes of Paleoleishmania neotropicum in the proboscis of Lutzomyia adiketis. Arrow shows amastigote with nucleus and kinetoplast. Bar = 7 μm. Two paramastigotes of Paleoleishmania neotropicum in the proboscis of Lutzomyia adiketis . Note long flagella. Bar = 5 μm. Promastigotes (N = 20) Flagellated stages containing nuclei and kinetoplasts; ranging from 6–10 μm in length, 1–3 μm in width and with flagella ranging from 6–11 μm in length (Figs. 5, 6, 7, 8). Amastigotes (N = 20) Spherical to oval, containing nuclei and kinetoplasts, ranging between 4–7 μm in greatest diameter (Figs. 9, 10). Paramastigotes (N = 4) Oval, relatively short, 3–5 μm in length and 2–4 μm in width, with adjacent nuclei and kinetoplasts; flagella long (10–20 μm)(Fig. 11). Amber mine in the Cordillera Septentrional of the Dominican Republic. 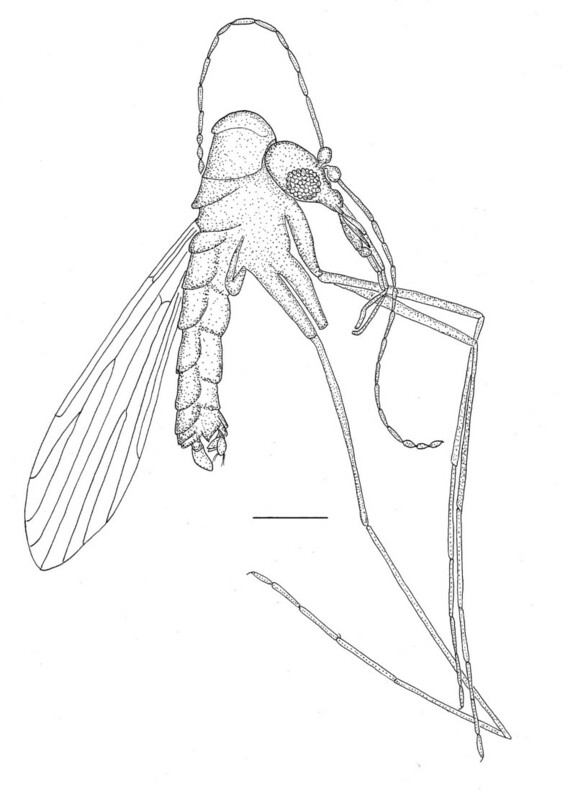 The insect host, Lutzomyia adiketis (Diptera: Phlebotomidae), is described in the present work. The vertebrate host is unknown. The absence of an eye bridge, fusiform flagellomeres, Rs four branched, 2 longitudinal veins present between the radial and medial forks and A1 absent, place the fossil in the Phlebotomidae [2, 8]. The species shares many characters found in the extant subgenera Lutzomyia França and Pintomyia Costa Lima 1932, however the latter genus is characterized by a row of spines on the femur, which the fossil does not possess, thus it is tentatively assigned to the subgenus Lutzomyia. Lutzomyia adiketis differs from all previously described Dominican amber sand flies by its forked Sc vein, a previously used diagnostic character [3–5] and a character that occurs on some members of the subgenus Lutzomyia . Four different configurations of the Sc vein exist in sand flies . The Sc vein can be free, with the distal end not connected to either the costa or R1, as occurs in the Dominican amber Pintomyia paleotownsendi Andrade Filho et al. and Pintomyia falcaorum Brazil et al. , Sc can meet the costa vein, as in the Dominican amber P. paleotrichia Andrade Filho et al. or the Sc can meet R1, as in the Dominican amber Pintomyia brazilorum Andrade Filho et al. , P. killickorum Andrade Filho et al. and all five species described by Peñalver & Grimaldi . The fourth condition, where Sc forks distally, uniquely occurs only on L. adiketis, among the described Dominican amber fossils. In addition to the forked Sc vein, the lengths of the papal segments, especially the second, fourth and fifth, the ratio of palpal segment 1 to palpal segment 2, the length/width ratio (4.1) of the wing and values of α, β, δ, γ, on L. adiketis differ from corresponding values of the five species of Peñalver & Grimaldi . In order to exclude intraspecific variation due to size alone, ratios were found to be more useful than the actual values in several cases. Thus the ratio β/α (0.86) in L. adiketis (compared to a range of 0.57–0.71 in the species of Peñalver & Grimaldi ) and the ratio δ/β, (0.09) in L. adiketis (compared to the range of 0.14–0.38 in the species of Peñalver & Grimaldi ) distinguishes L. adiketis from the latter species. Some extant sand flies in the subgenus Lutzomyia also have a forked Sc vein , however they can be distinguished from L. adiketis by the following characters. In Lutzomyia alencari Martins, Souza & Falcão, vein R1 meets the costa at the same distance from the wing base as CuA2 meets the wing margin. 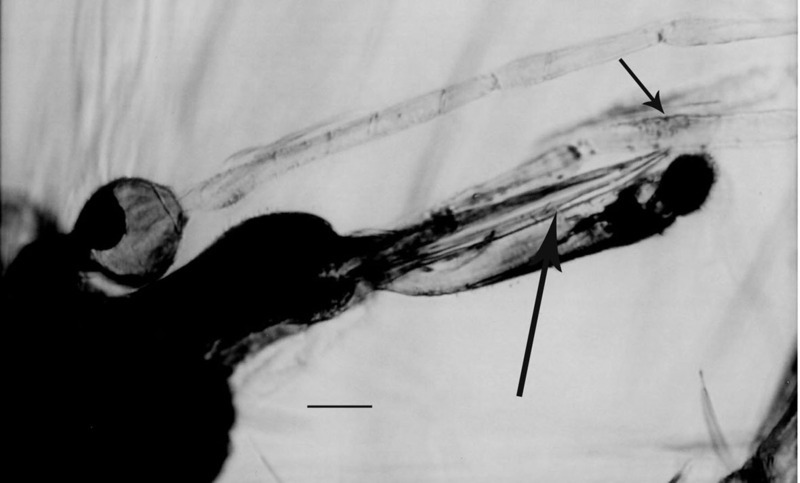 In L. adiketis, CuA2 meets the wing margin distal to the termination or R1. The wing ratio δ/β can be used to separate L. adiketis (0.09) from L. gasparviannai Martens, Godoy & Silva (0.57), L. ischyracantha Martens, Falcão & Silva (0.00) and L. ischnacantha Martins, Sousa & Falcão (0.89). The ratio of the length of R 2+3 to R 2 in L. gaminarai (Cordero, Vogelsong & Cossio)(0.86) is larger than the same ratio in L. adikites (0.74). There are only two extant species of Lutzomyia found in the Dominican Republic [L. cayennensis hispaniolae (Fairchild & Trapido) and L. christophei (Fairchild & Trapido)], both of which belong to the Verrucarum species group . None of the species in this group have forked Sc veins, which separates them from L. adiketis. It is unfortunate that characters of the female external genitalia are so little used in the systematics of the group, even though their diagnostic importance was demonstrated by Mukhopadhyay and Ghosh . The size and shape of the cerci, lobes on the 8th sternite and spatulate rods on the ninth sternite could serve as diagnostic characters. The spatulate rods on L. adiketis are quite distinctive and similar rods have not been observed on any other amber sand flies examined by the author. Extant species of Lutzomia are restricted to the New World and their host range is quite extensive, including over 30 families of mammals, birds, reptiles and amphibians . Several extant members of the subgenus Lutzomyia feed on humans and are proven vectors of Leishmania infantum chagasi, the causal agent of American visceral leishmaniasis . The vertebrate host of L. adiketis is unknown. 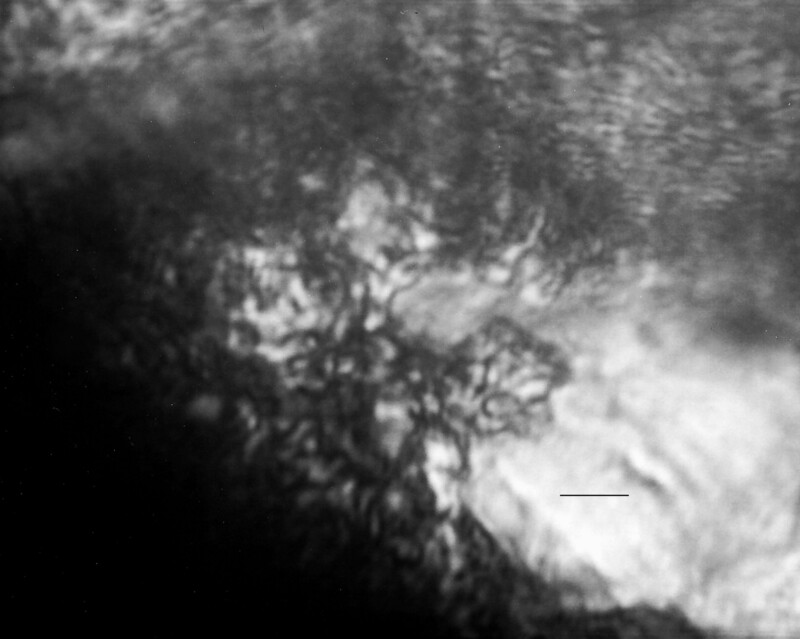 A single, anteriorly directed flagellum, compact kinetoplast and nucleus places P. neotropicum in the family Trypanosomatidae. The presence of amastigotes is evidence that L. neotropicum is digenetic, since in Leishmania, amastigotes are only formed in the vertebrate host and there are no known monogenetic flagellates of sand flies . Paramastigotes (metacyclic stages), which are produced inside the gut of the sand fly, also are only infective to vertebrates [18–23]. The flagella always emerged from the anterior end of the flagellates and were not attached to the body along part of most of their length by undulating membranes. Thus, it is unlikely that the fossils belong to the monogenetic genus Blastocrithidia Laird, since the epimastigote stage dominates the life cycle and it has never been recovered from sand flies . Species of Endotrypanum Mensal & Brimont, which are vectored by sand flies and form promastigotes and amastigotes in the vector , are restricted to sloths today and all sloth remains in Hispaniola are from Quaternary cave deposits . If sloths were absent in Hispaniola during the mid-Tertiary when Dominican amber was formed, it would have been impossible for Lutzomyia adiketis to acquire Endotrypanum. It is also unlikely that the flagellates belong to the related genus Phytomonas Donovan since extant species only occur naturally in plant-feeding bugs (Hemiptera). No vertebrate blood cells were found in the sand fly, however these would be very difficult to detect in the thoracic gut of the intact insect. The round amastigotes of Paleoleishmania neotropicum are similar in size (4 – 7 μm) and morphology to those of extant species of Leishmania [19–21, 23]. Since amastigotes are normally ingested with the blood meal and pass into the midgut of feeding sand flies, the amastigotes in the fossil proboscis may have arrived in that location immediately after the fossil sand fly finished feeding and became entombed in resin. The amastigotes may even have been multiplying in that location since in Leishmania chagasi, a cycle of amastigote division may occur before or even concurrently with the transformation of amastigotes into promastigotes . Another possibility is that the amastigotes were regurgitated into the proboscis while the sand fly was struggling to escape from the resin. Promastigotes of extant Leishmania spp. vary from 6 to 24 μm in length (excluding the flagellum) [19–21], which are within the size range of those reported here (6–10 μm). 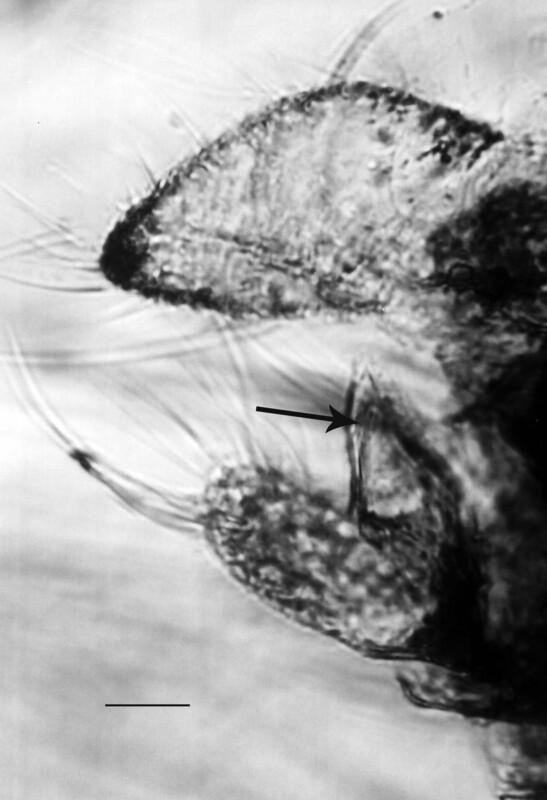 The promastigotes in the proboscis of L. adiketis (Fig. 9) could have developed from amastigotes or they could be "infective promastigotes", similar to those of Leishmania chagasi, which occur in the mouthparts (ventral surface of the labrum-epipharynx) of Lutzomyia longipalpis . However, it is also possible that the promastigotes in the proboscis were acquired directly from the vertebrate, since in reptilian hosts, the stages imbibed can be either amastigotes and/or promastigotes [25, 26]. The paramastigotes in the proboscis of L. adiketis (Fig. 11) probably developed from an earlier blood meal. Female sand flies are capable of living a month or more  and normally engorge blood at least twice during their lifetime, with a batch of eggs laid after each blood meal . The main diagnostic characters of P. neotropicum at this time are the structure of the amastigotes, promastigotes and paramastigotes, and its association with the extinct sand fly, Lutzomyia adiketis, in Dominican amber. Fossil evidence has provided a possible scenario of how sand fly-trypanosomatid associations evolved [28–30]. Free-living trypanosomatids that were associated with a fungal food source also occurred in the alimentary tract of a sand fly larva in Burmese amber. It is postulated that these flagellates were carried transtadially into the adult stage and then transmitted to vertebrates. The establishment of the parasites in the vertebrate and their subsequent re-acquisition by adult sand flies is undoubtedly a rare event and would only occur under ideal conditions. It is unknown whether Leishmania originated in the New or Old World [31, 32]. If the above evolutionary pattern of flagellate acquisition is correct, different strains of trypanosomatids could have appeared at different localities and times over the past 100 or so million years. 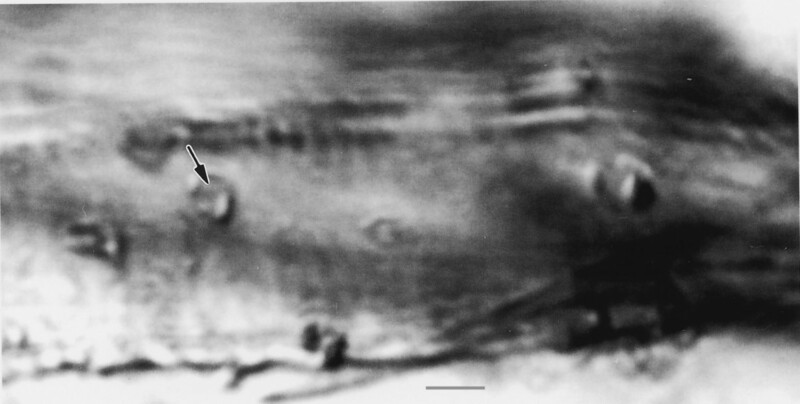 The 100 million year-old Burmese amber sand fly-trypanosomatid, P. proterus [6, 7] undoubtedly arose independently from P. neotropicum, which could well be the progenitor to one or more of the Neotropical Leishmania clades. Fossil vertebrate parasites inside insect vectors in amber provide us with a time and place record of diseases affecting terrestrial organisms [27, 29, 33, 34]. The present study provides the first fossil evidence that Neotropical sand flies were vectors of trypanosomatids in the mid-Tertiary. Lutzomyia adiketis, in Dominican amber, is an extinct species of sand fly that was carrying the trypanosomatid Paleoleishmania neotropicum. It is possible that P. neotropicum is a progenitor of at least one of the several extant Neotropical Leishmania clades. 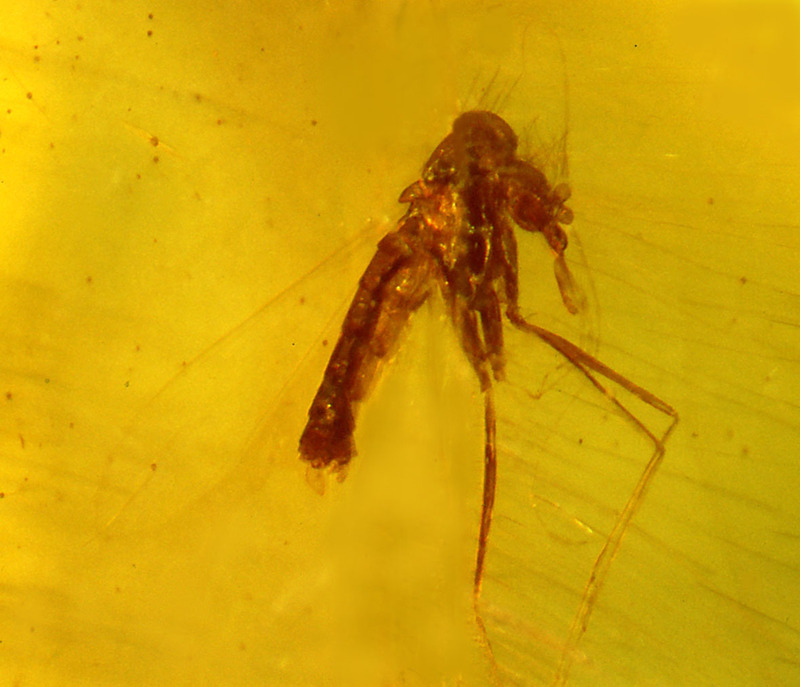 The amber piece containing the fossil sand fly with the trypanosomatids is oval in outline, measuring 18 mm along the long axis, 12 mm along the short axis and 2 mm in thickness. The sand fly is well preserved but both middle legs and the left hind leg are detached, as are almost all hairs from the antennae. Remains of these, along with many body hairs, are positioned behind the fossil, indicating that the sand fly struggled forward to free itself from the resin. The alimentary track was ruptured, allowing some flagellates in the gut to leak into the hemocoel. Observations, drawings and photographs were made with a Nikon SMZ-10 R stereoscopic microscope and Nikon Optiphot compound microscope (with magnifications up to 1050×). Some of the photographs were enhanced in Adobe Photoshop. The amber containing the fossils was mined in the northern mountain range (Cordillera Septentrional) of the Dominican Republic between Puerto Plata and Santiago. Dating of Dominican amber is controversial, with the youngest proposed age of 20–15 mya based on foraminifera  and the oldest as 45–30 mya based on coccoliths . Most of the amber is secondarily deposited in turbiditic sandstones of the Upper Eocene to Lower Miocene Mamey Group . Dominican amber was formed by the extinct legume tree, Hymenaea protera Poinar  and the original landscape was considered to be a moist, tropical forest . Terminology in the description follows that presented in the "Manual of Nearctic Diptera" . I thank Art Boucot and Roberta Poinar for reading earlier drafts of the manuscript and R. L. Jacobson for references and comments.